I’ve been on a bit of a Kansas City history kick lately. Not too long ago I read The Brookside Story, a thin volume about the creation, development, and evolution of a neighborhood I work in and live near. Designed by the legendary J.C. Nichols, more famous for developing the renowned Country Club Plaza, Brookside is a massive success story in that it has endured for almost a century with its founder’s core values largely intact. No small feat considering the modern penchant for huge shopping centers and monolithic brand names. Another book about several of Kansas City’s enshrined elite has no such happy endings. 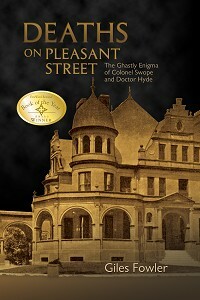 Deaths on Pleasant Street tells the shocking tale of the apparent murders of three members of the prominent Swope family. Among them is Thomas H. Swope himself, one-time owner of much of the land Kansas City now sits on and whose philanthropic ways are most evident in the 1800-acre Swope Park. The case is something that even writers of the latest CSI: episode might find too far-fetched. Estranged nephew-in-law and up-and-coming doctor Bennett Clark Hyde is alleged to have poisoned two of the Swope family and infected several others with the deadly typhoid bacteria. By the time the third Swope finally succumbed to typhoid infection, the family’s suspicions were firmly in place, setting the stage for a trial that not only captivated Kansas Citians, but the entire nation. Author Giles Fowler does a great job of putting the reader squarely in early 1900s Kansas City, including nice details about how Thomas Swope’s funeral unfortunately intersected with the Mardis Gras-like Priests of Pallas celebration, the story of a local self-styled herbalist whose over-the-top persona was shattered by intense media scrutiny, and the inclusion of the era’s sensationalist media coverage, a lot of which seems eerily similar to current attitudes in journalism. But the murder case and the cast of characters tell an incredible story all on their own, a cast that reads like a who’s who of Kansas City luminaries or a city map. Swope. Hyde. Kemper. James A. Reed. And while the aforementioned J.C. Nichols wasn’t a player in the saga, it’s easy to imagine him reading the latest developments in The Kansas City Star over breakfast. Unlike Nichols and his “plan for permanence,” the Swopes are virtually shattered by the murders. The costs of hiring their all-star team of lawyers headed by Reed severely depleted their fortune, and the upcoming Depression sapped what remained. The house in Independence where the tragedy took place was sold in 1920, bulldozed in 1960, and is now an RV park. And as incredible as the story of these deaths was, it seems as forgotten now as the once-triumphant Priests of Pallas revels. Names on street signs, plaques in parks. Tags: history, Hyde, Jackson County, Kansas City, Missouri, murders, Swope. Bookmark the permalink.